A series of seamless safety gloves made of textured (flexible) polyamide filament yarns with different weight of the fabric. They belong to the group of clean (dust-free) gloves, and do not leave any traces on objects which they come into contact with. A wide range of applications due to the high comfort of use, breathability, good fit on hand and profitable quality to price ratio. Gloves of this series (without PVC dots) have the Polish National Institute of Hygiene health certificate allowing them to be used in auxiliary works in the food industry. The ROP/2 model is a super-lightweight glove guaranteeing perfect feel and very good manuality. They are also available in open fingers version or in non-standard lengths. Version with PVC dots on the inner side of the palm (letter V in the product symbol) improves the grip and facilitates handling of objects. 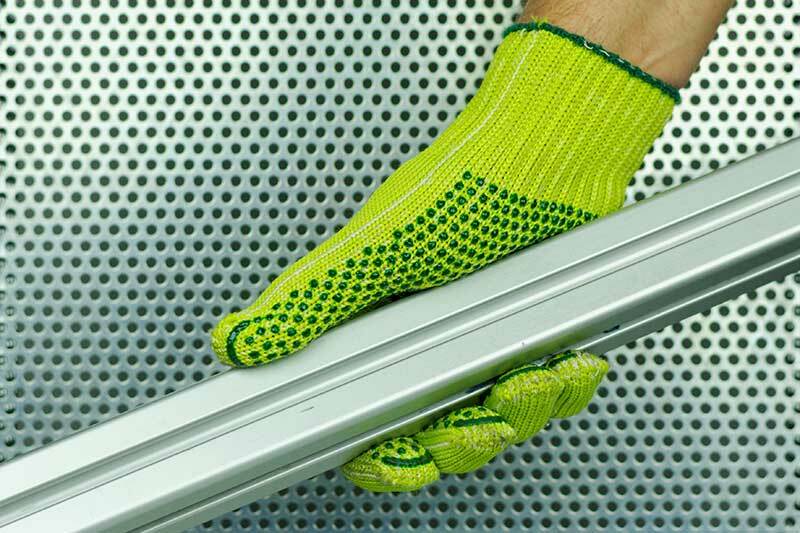 Knitted, seamless safety gloves made of textured polyester filament. They belong to the group of clean (dust-free) gloves, and do not leave any traces on objects which they come into contact with. A wide range of applications due to the high comfort of use, good fit on hand and profitable quality to price ratio. Version with PVC dots on the inner side of the palm (letter V in the product symbol) improves the grip and facilitates handling of objects. Gloves of this series (without PVC dots) have the Polish National Institute of Hygiene certificate allowing them to be used in auxiliary works in the food industry. They are also available in open fingers version or in non-standard lengths. The ROSA antistatic version complies with the ESD* requirements in accordance with the EN 1149-1 standard, preventing accumulation of charges that might damage electronic parts. 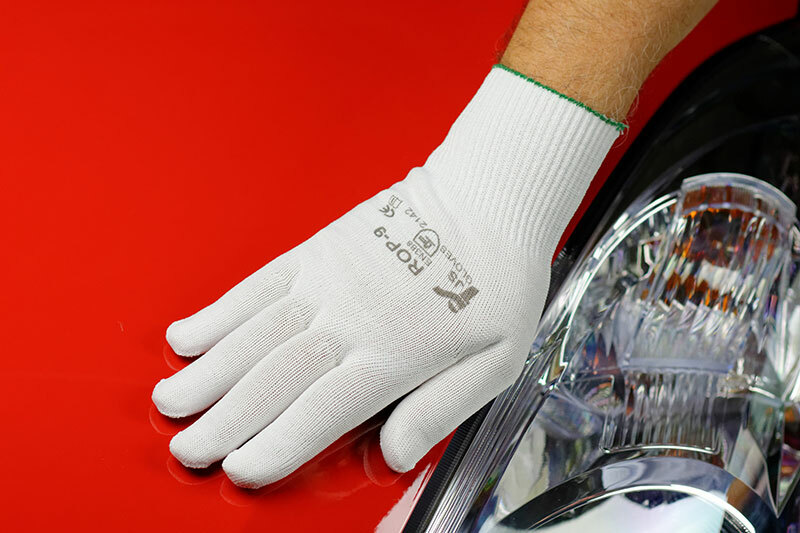 Knitted, seamless ROE series safety gloves made of a blend of cotton and polyester cut fibers. They ensure basic protection against minor hazards; they may also be used as liners for rubber, latex and other gloves. As standard, they are available in grey melange colour, but they may also be manufactured in other colours, on demand of the customer. The remaining gloves of this series are manufactured with the plating method, with the use of polyamide or polyester filament (outer shell) or cotton (liner). Popular and widely used due to their basic protection parameters, high comfort of work (achieved by the application of cotton inside) and attractive price. They are also available in open fingers version or in non-standard lengths. Version with PVC dots on the inner side of the palm (letter V in the product symbol) improves the grip and facilitates handling of objects. A series of seamless gloves made of high quality cotton yarn in different weights. Skin friendly. 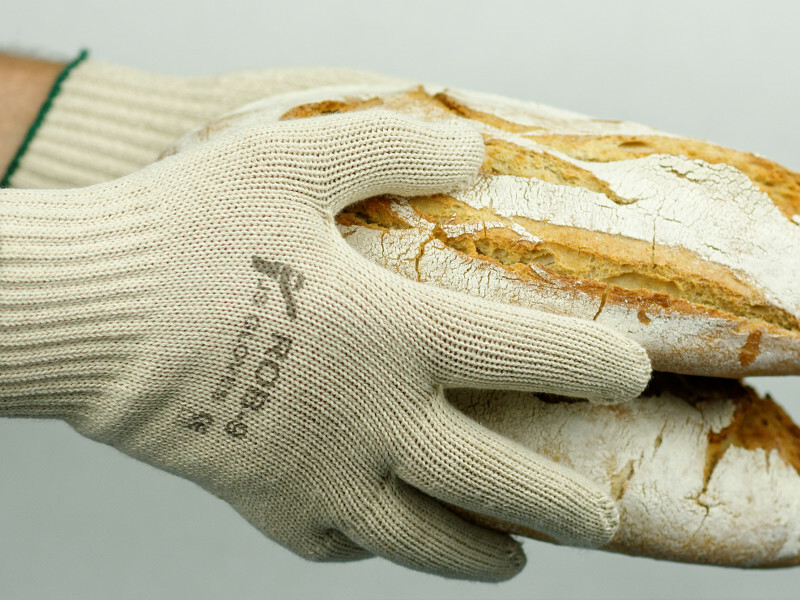 The gloves of this group, in their version without PVC dots, have the Polish National Institute of Hygiene certificate allowing them to be used in direct contact with food in the bakery and confectionery industry, as well as in auxiliary works in other sectors of the food industry. They ensure basic protection against minor hazards. They are widely used as liners for rubber or latex gloves. Clean, natural cotton is a skin friendly material, guaranteeing high comfort of work without irritations even in long-term use. The gloves are also available in open fingers version or in non-standard lengths. Version with PVC dots on the inner side of the palm (letter V in the product symbol) improves the grip and facilitates handling of objects.